the fox and the mountain: Last minute Christmas stocking. I had intended to knit a christmas stocking for Maisie but with other knitting to finish and some pre-christmas travelling; I never got around to it. So decided to chance a bit of amateur sewing! 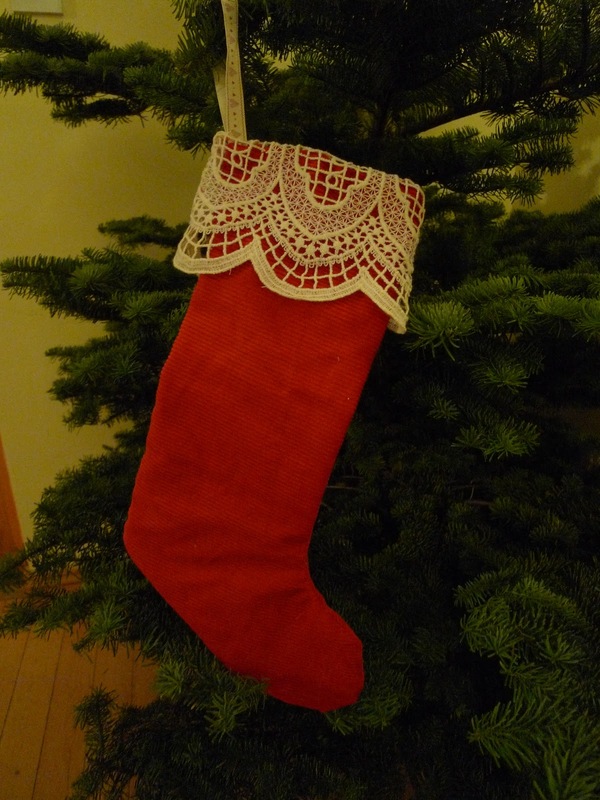 I cut a sock shape on some paper, cut out two of this shape onto some lovely red cordy fabric, sewed (badly) the two pieces together and stuck a bit of old lace on top. The lace was left over from a dress for my sister that my auntie made....back in the seventies I'd say! On close inspection it's a bit messy but from afar and on my mantelpiece with a tangerine in the toe it looks sweet!